We are formed in our youth. We are formed by our parents’ instruction and example, by our teachers, our friends, our culture, and our religious affiliation. We typically don’t know to what extent this happens, or how deep it goes, until later in life, and then only if we care to know. As a youth I was immersed in, and formed by, the evangelical/baptist/fundamentalist culture of the 1970’s. I was affected by both a love and a wariness. Although I was not directly involved in the Californian/Calvary Chapel/”Love Song”/Jesus People kind of Christianity, I was influenced by them more than I knew. That “hippy” Christianity, one of long hair, wide collars, bellbottoms, and tripping on Jesus, was meant to confront the western world of that time in terms that would speak to that culture in its own language. In many way it worked. The culture was reached, and so was the Church. Within Catholicism, which was watching closely, grew a felt need to strip away the old and usher in the vibrant new — a new that consisted of folk music and more playful rubrics. But accommodation took its toll. This was true in Protestant culture as well. I saw church services go from the formalism of my grandparents time, to the laissez faire of today where church services are more like rock concerts and preachers try hard to be un-stuffy and hip. For better and for worse, sometimes much worse. Below are videos of that crucial era of modern Christianity where the seeds were sown for what we experience today, and for what we assume and take to be normal for worship, preaching, the language of the gospel, and how to do church. It is fascinating to see something that is so distant in some ways from us today and yet so utterly contemporary. Although I have moved away from this version of Christianity in many ways (or am trying to) I still love the fundamental passion and simple Christ-focussed nature of it. That is something I never want to lose. I’m curious if any readers experienced this kind of Christian experience, and what you think of it now. Tagged as Calvary Chapel, Chuck Smith, Jesus freaks, Jesus movement, Jesus music, love song, Maranatha! I suppose one could say the moral of the following post is about humility. Not long ago I sat in a pastoral council meeting at my parish church. We were discussing the form of Mass, use of music, etc., and I heard an older gentleman, a servant of the church, a good man and Catholic, exclaim that he loved the liturgical changes brought on by the spirit of Vatican II, and thought they were one of the best things that ever happened to the Church. His words gave me pause. Catholics waiting for someone to bring them a folk-mass? From this image alone one might imagine the younger generation of that day reacting to a perceived ossification. I have become increasingly interested in the more solemn Traditional Latin Mass, something very new to me, which many see as harkening back to a pre-council time. Consequently I tend to dislike what I perceive as the terrible music and bad art so common (I assume it’s common, from what I hear and read) in contemporary worship services today — all brought on by Vatican II according to popular legend (assuming that legends can also be true). But then I had to step back a bit and think about it. Am I right in my opinions? Perhaps yes, but perhaps no. I’m not sure this is from a Catholic Mass or Protestant service, but you get the idea. I’m not a folk-Mass or guitar-Mass kind of guy, but under the auspices of “full disclosure” I must say I’m pretty sure I would have embraced the changes the Church experienced in the 1960’s if I had been a young man then. I know there are many today who lived through those radical changes and feel that the changes were forcibly imposed on them. I’m sure that’s true, but I would guess at least some of those sufferers are not entirely honest. I bet a number of folks who welcomed the changes only later hated them. And like so many, it is likely that I too would have thought those changes represented a great and positive shift to a more authentic and grounded expression of faith. However, I am certain I also would have eventually changed and embraced a more traditional style as I got older. I say this because, as a Protestant, I went through a similar experience in the 1970’s and early 1980’s. I grew up in a rather conservative, staid kind of Baptist church, but I began to embrace Christian rock, and enjoyed how the youth groups changed with the times, and then “big” church changed to a more rock-n-roll ethos as well. I don’t like rock-n-roll church either, but I did years ago. And I changed over time. I began to see that emotional manipulation (a welcomed and sought after manipulation) was the primary function of the “worship team” in so many churches. I realized the folk and rock inspired music was actually about us and our internal feelings (mostly feelings about ourselves) rather than about God. I don’t believe the serious question of what kind of music is appropriate at Mass is a question of taste, though taste plays a part. It’s deeper than mere taste, for it has to do with the fact of the Real Presence and human nature. How one feels at Mass is not as important as what Mass is; in other words, it’s an ontological question, not an emotional one. 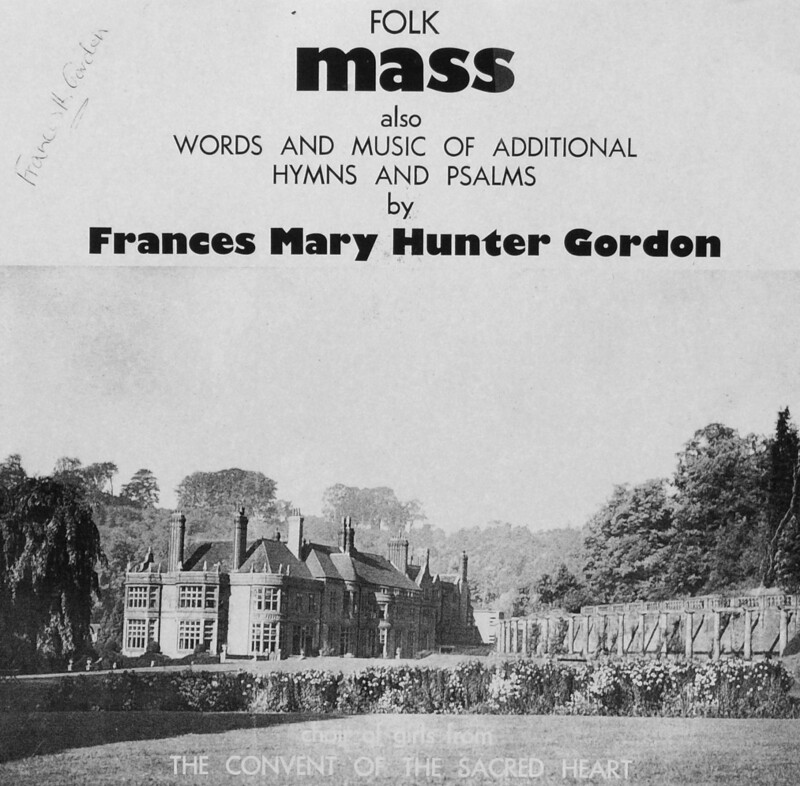 Folk and rock are great genres of music, but they are arguably inappropriate for the Mass because of the Real Presence and human nature, and the very purpose of the Mass itself. So why would such changes been made if all this is so obvious? The fact was it wasn’t all that obvious, at least to a certain generation at a certain time and place. Of the many shifts of the 1960’s, one was towards a kind of youth leadership. That is, youth began proclaiming its divergence from older generations, and grabbed the reigns of its own destiny. This shift was, perhaps, nothing terribly new, but interestingly the older generations embraced the change, often declaring their own generation had lost its way and only the youth have the answers. We must listen to the youth was a common attitude for many of the “lost” older generation. Some telling slogans appeared in popular culture: “I hope I die before I get old” was a line from the band The Who in their anthem My Generation. “Don’t trust anyone over thirty” was a phrase coined by Jack Weinberg in the heady days of the Free Speech Movement. This shift also precipitated a revolutionary spirit, leading to many protests and the belief that the youth could really change the world if they just let love reign. 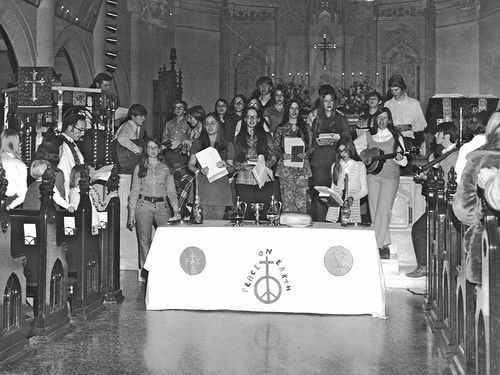 In Protestantism there was the Jesus Movement, a kind of hippie Christianity that had profound ripple effects throughout Protestantism, and also Catholicism (as many Catholics became fascinated with the more emotive forms of Protestant spirituality in light of the perceived deadness in their own). In fact, it became a sweeping movement of sorts, and many, many people were caught up in it — not unlike being caught up in the spirit. This time, though, it was the spirit of the age. And who owns that spirit? Folk music and then rock music were powerful cultural expressions of the 1960’s zeitgeist, and they continue to today. 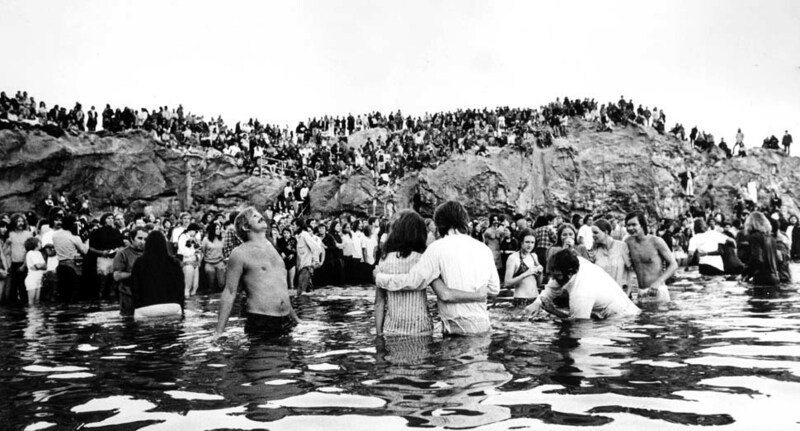 May 5, 1973: Hundreds of Calvary Chapel members line Corona del Mar beach for baptism ceremony. Calvary Chapel, lead by Chuck Smith, was a major influence on modern American Christianity. But this shift in the zeitgeist of 20th century Christianity also had humble, simple, and personable expressions. Expressions that, I believe, constituted a kind of healthy “reformation” within the Church — often drawing people into a closer, more intimate relationship with Jesus Christ and each other. But there was a mood in the air. Old was fake, self-absorbed, plastic; the youth were authentic, seeking, made of flesh and blood. The old had little to offer the youth, and what they did offer seemed already dead. These feelings were felt by many, young and old. Consider how one (maybe you) feels after having gone to a deeply emotional and moving (perhaps even Christian) rock concert, with its powerful music, smoke machine, and light show, and then the next morning you go to church and it seems so blah. Couldn’t you argue that you were “closer to God” at the concert? At least you felt that way, right? The same feeling would have been common in the 1960’s with its folk music, which seemed so much more authentic than dusty old hymns. I understand this. Bob Dylan was a prophet. “The Times They Are A-Changin'” seems a better homily than is often preached by many a priest. Peter, Paul and Mary sang truth. “If I Had A Hammer” is a more viscerally powerful sermon than most any Baptist preacher can muster. A young adult looking for such a connection at church just might welcome a couple of guitars and some bongo drums in the service of a passionately sung worship ballad in four-four. I was that young adult. I still have those proclivities to some degree. Given all that, after hearing that older gentleman at the pastoral council wax positive about those Vatican II changes of yesteryear, I realized my tendency to denigrate those changes of the post-Vatican II era is not an entirely honest tendency. Nor might it be entirely empathetic or loving. I still prefer a more traditional form of Mass, and I tend to think that guitars generally have their place outside of Mass, but I cannot assume I’m really any different than anyone else. I have come to this position over time, and I’m still on my journey. I am sure my current preferences are in reaction to my own experiences over a number of years. I too am a fish in the stream of history — and it just goes to show how easily I can forget myself. Final note: Let us not forget the Real Presence at Mass. The question of proper form and proper music at Mass flows from this profoundly radical fact. It’s not ultimately about a particular style, or particular instruments, or specific lyrics, as much as it is about appropriate reverence and worship, which includes proper action, and what it is that leads us to that. Understanding how much of contemporary music, especially folk and rock, does not fit within a Catholic liturgy may require a sensitivity and a knowledge most of us are unlikely to have; not because we can’t understand, but because our culture has trained us not to.